KWPN, Braun/bay *2004, 172 cm Indisputable champion at the KWPN licensing in 2007. �Fantastic technique of movement in all three basic gaits, an outstanding topline and the desired long legs�. This is how Arie Hamoen, head of KWPN grading committee, described the champion stallion Blue Hors Zack in �s-Hertogenbosch. �We cannot think of a better picture to display the Dutch breeding�. At the performance test at Vilhelmsborg in 2007 Zack once again lived up to the expectations and came second in dressage with 860 point! Zack received 9.5 for his canter and for capacity. Blue Hors Zack is out of the most prevailing bloodlines in Holland at the moment. 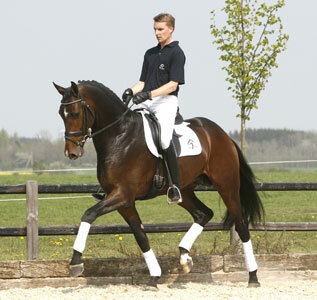 His sire Rousseau is by the international dressage stallion Ferro, competed by Coby van Baalen at the Europeans, WEG and Olympics achieving Dutch team silver in Sidney. Rousseau himself won the performance test in dressage and has won the Pavo Cup with a record breaking score. Both test riders gave him 10.0! At the age of 5 he won silver at the world championships for young horses in Verden. Four sons out of the first crop by Rousseau were approved in Holland in 2006. One of them, Wamberto, became champion stallion and sold to the USA. Rousseau had another four sons approved in 2007 and with Blue Hors Zack the incredible Rousseau went down in KWPN history having sired his second champion stallion in two years! Zack is the second foal out of Orona who has placed in medium level dressage and passed the mare performance test with a very good result. 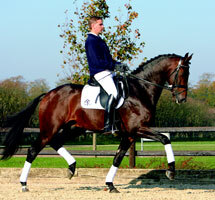 Dam sire Jazz, an international Grand Prix horse, is one of the most frequented sires in Holland. Jazz was competed at the WEG in 2002 by Tineke Bartels and has produced numerous highly graded mares and many competition horses. Four times have progeny of his won the Pavo Cup. KWPN champion stallion 2005 Johnson is by Jazz. Performance test winner Belisar has sired a great number of sport horses and holds a dressage index of nearly 150. He is the sire of the well-known stallions Houston og Kroonjuweel. Blue Hors Zack is approved in Denmark, KWPN and Oldenburg.